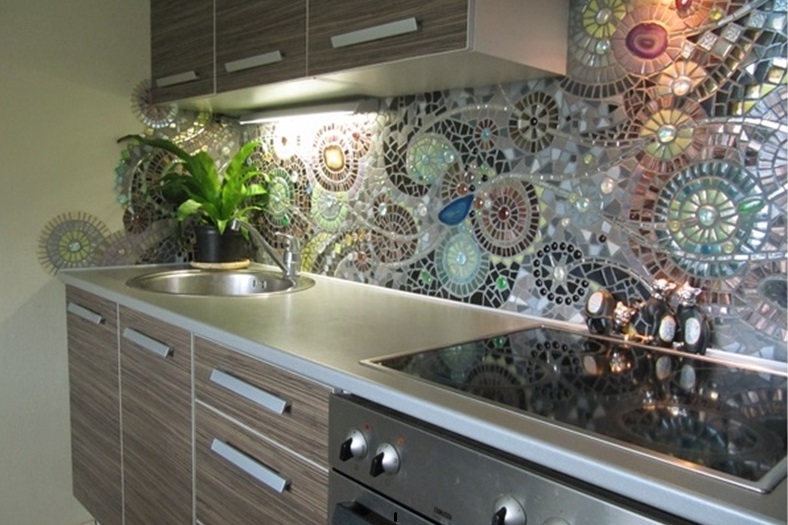 In the kitchen renovation selecting cool decorated backsplash is almost half the job. After all, you need to find indestructible and most importantly beautiful material. Below we will show you interesting and unusual solutions. 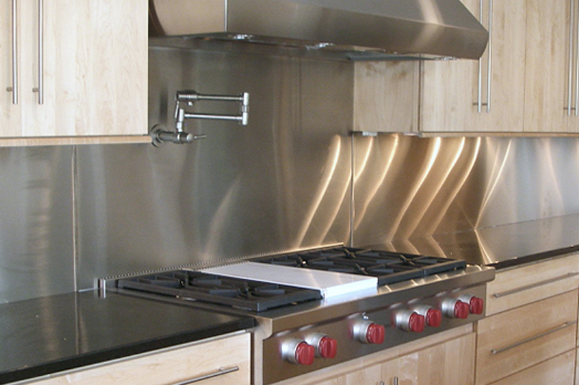 If the main goal is spectacular backsplash then metal is undoubtedly your choice. It fits almost any style. It can be in large sheets, covering a significant area of the backsplash or cut-out mosaic of different formats. The main thing you should pay attention to is grout. If you want a shiny surface then apply the mixture carefully. 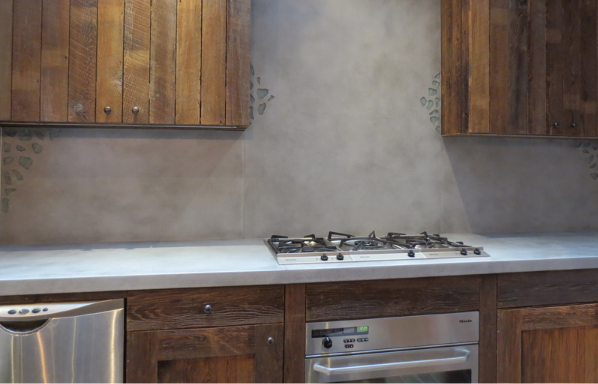 And if you want to give your backsplash aged look grout can be applied more chaotically. Many people are afraid of using it. Their main concern is how to wash and what to do with it. Don't be afraid. Brick is not the material to be scared of. But if you still can't cope with the emotions and worry for its safety there is one design hack – you can always cover it with a glass. You can cover it fully or in the zone of maximum contamination (stove) this will make sure that nothing will happen to it. I must say, plain glass looks really nice. 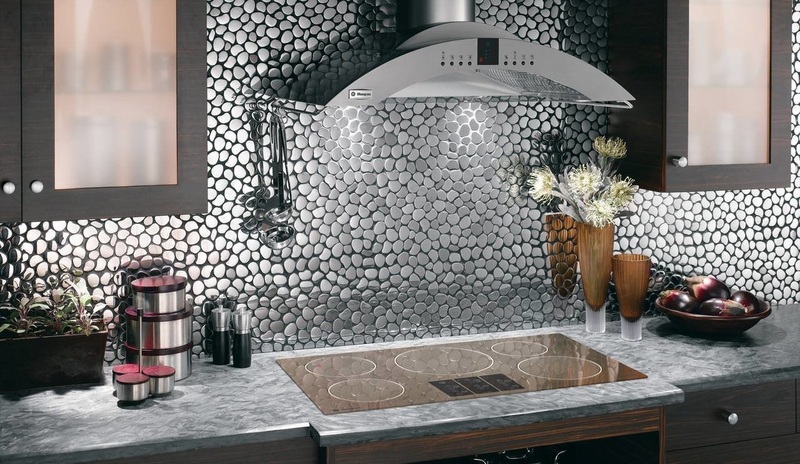 But if you want backsplash with a picture, choose a quality photo with good resolution or vector patterns. If you really want New York City at night panorama think twice before you decide. Black and white city on the walls is a Hello from the 90's, and if you don't wear a shirt with shoulder pads, it makes sense to abandon the idea. 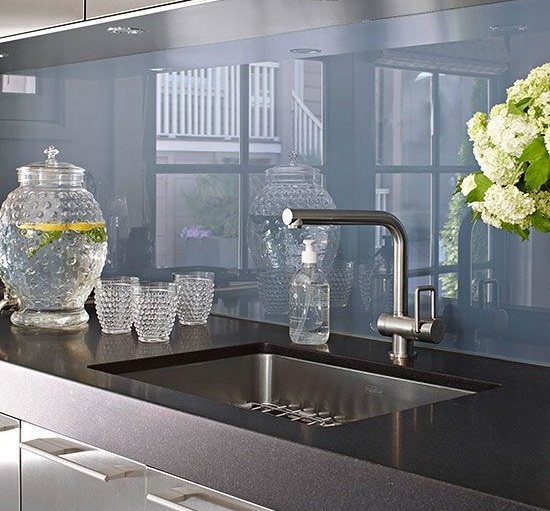 This material can make the most dramatic impact on your kitchen. 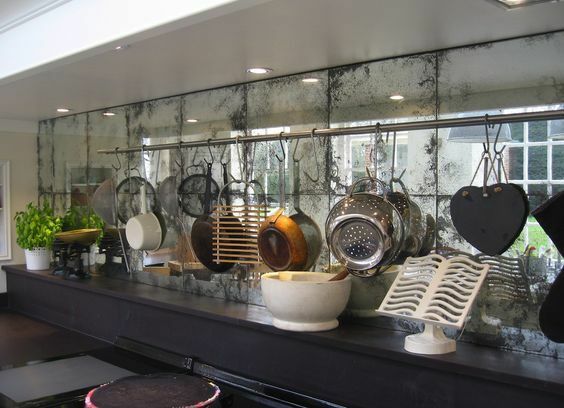 It can be used as a large mirror surface or cut into small pieces and used as a tile. However, don’t forget that the mirror is not only beautiful but also gets dirty easily. A good solution is an artificially aged surface. Dirt drops and other products of culinary activities will be less visible on it. Unfortunately many underestimate the use of paint in for this purpose. There are thousands of shades and dozens of possibilities. For the backsplash, it is good to choose a paint that can be washed. And another cool idea is to paint it with coating for blackboards. This will allow you to write down the recipes, leave love messages and calls to wash the dishes, make shopping lists and draw on it even every day. Don't like the dark color? You can paint it by hand or apply a pattern with a stencil and chalks. Though its use is more popular for furnish rooms this material will still look great in the kitchen backsplash. The only thing you need to be careful of is to avoid using an excess amount of plaster in the decor. The rule of "the less is more" works here perfectly. If you cover up all the walls than instead of the stylish space you may get very sad and gloomy design. No, not just the squares on the mesh (although we also love this), but beautiful, intricate patterns and unusual formats. 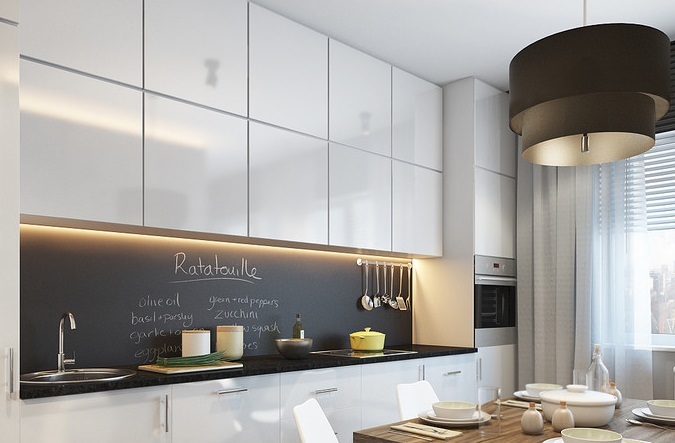 And it’s not necessarily to cover the whole backsplash, you can make an ornament only above the stove or around the perimeter of the backsplash. Almost everyone loves the sea. If you do not belong to the inhabitants of southern latitudes or don’t have the opportunity to observe the sea from the window all year round you can still bring the sea spirit closer for you. A cool option for this is to use gravels. You can organize the stones yourself or you can buy the clutch on the mesh. 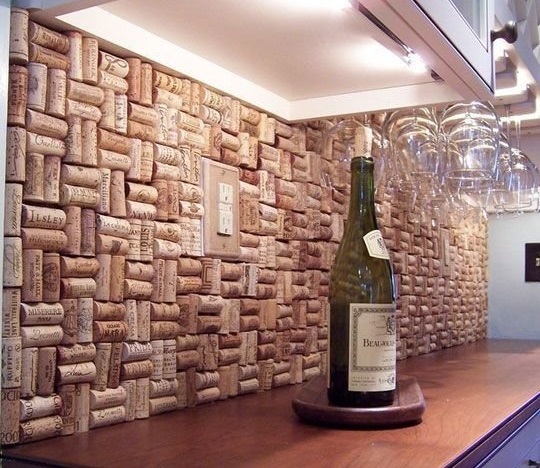 Wine corks, caps, moldings, broken dishes, three-dimensional tiles and anything else you can think of. This option is extreme, but its edginess is superior to all others. This the best option for people who like to be original. 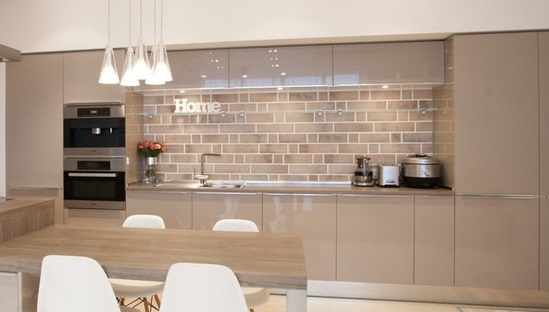 Recently thanks to the trend of doing everything green wooden panel on backsplash became very popular. This makes everything look cozy and at the same time fresh. 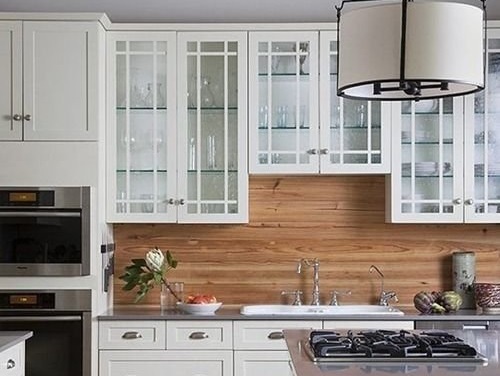 Wooden backsplash looks very interesting with almost all kitchen styles modern, classic, minimalist. If your countertop is made of wood you can order the same panel for the wall, or you can keep the focus strictly on the backsplash. Don't forget to process the material so that it can be easy to wipe and not worry about the safety.